Its turnaround plan is taking hold, and investors responded to that good news last month. 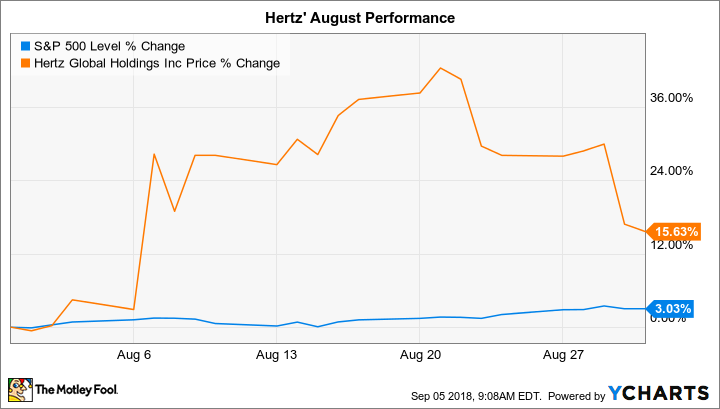 Rental car giant Hertz (NYSE:HTZ) outpaced the market by gaining 16% last month compared to a 3% increase in the S&P 500, according to data provided by S&P Global Market Intelligence. The boost wasn't enough to put the stock in positive territory this year, though, and Hertz remains down significantly over the past 52 weeks. Last month's rally came as investors reacted positively to second-quarter earnings results that showed encouraging progress in its turnaround plan. Sales grew in each of its core business segments, and adjusted net losses improved to $16 million, or $0.19 per share, from $52 million, or $0.63 per share, a year earlier. Executives sounded optimistic about their growth strategies in early August, saying the latest results show "our turnaround initiatives are bearing fruit." Hertz is still saddled with weak operating margins, rising costs, and a significant debt load. These challenges suggest investors can't yet assume that its rebound is on firm footing. Still, given that the stock had collapsed by over 70% in the past three years, even modestly positive results were bound to send shares higher. Now it's up to the company to build on that momentum through improved operating results in the quarters to come.